Up to 5Gbps of data transfer though each port with this USB 3.1 metal hub. Set up a horizontal or DIN Rail mount with the included mounting kit and make your connections. To power all ports, the hub is self-powered with an external 7~24V DC power adapter. 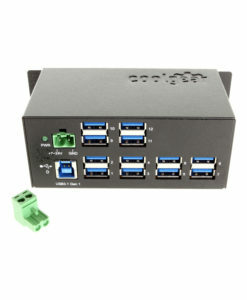 Coolgear’s new and unique 12-Port USB 3.1 hub is a compact solution with a big purpose. Its uniquely designed shell expands your USB port usage by 12 from your USB 3.1 Gen1 host port. This is a powered hub and uses a +7~24V DC 2-pin terminal block power connector from an external power adapter (sold separately). The 12-Port USB 3.1 hub supports up to 5Gbps of data transfer but is backward compatible with legacy USB 2.0/1.1/1.0 speeds. It can be DIN Rail or horizontally surface mounted to secure a stationary mount. 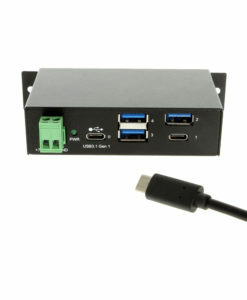 This USB 3.1 hub is in compliance with USB battery charging for CDP and DCP modes. The hub supports 1.5A per port with a safety of 2A Thermal Shutdown protection. 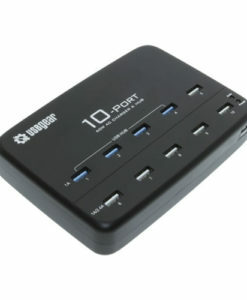 The 12 port USB 3.1 Gen1 Hub has certain accessories that work with it. These accessories are what you can order if needed.